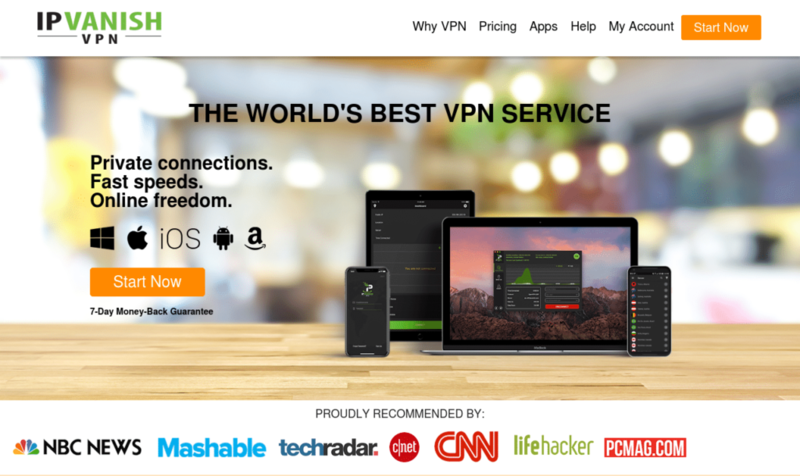 IPVanish proudly proclaims on their website to be “the world’s best VPN service.” That is a lofty claim with more Virtual Private Network (VPN) providers coming online every day; their network backs that up, but does the rest of the service? Having a reliable VPN is vital for anyone accessing the internet today. Companies track your activity and sell it. Public internet hot-spots are ubiquitous, but they may not be safe to use. Governments may block what content you can access. Your ISP may be putting artificial limits on your internet speed. A reliable VPN can help protect against all of these. A VPN essentially acts as a tunnel out to the internet. It will protect the internet traffic coming out from your computer or device from inspection by the ISP, but since it all goes through the VPN’s servers, if the VPN provider isn’t trustworthy you may be worse off. This is why “free” VPN services should be avoided. 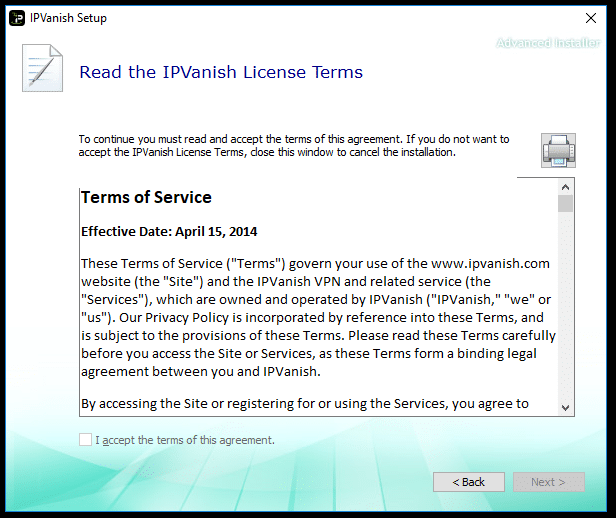 As a company, IPVanish was founded in 2013 as an offshoot of Highwinds network. This gives them their best edge and a claim that cannot be matched by many other VPN providers, that they own 95% of the equipment used. Other providers may need to rent servers, rack space, or internet connections to offer the large numbers of servers and IP addresses used for a VPN service. Since Highwinds offers other services, such as a content delivery network, they already have servers in place at many locations around the world and don’t need to rely on 3rd party providers. They were acquired by StackPath in 2017 and reaffirmed their privacy policies under the new management. It is important to note that their corporation is based in the United States. Because of their networking background, IPVanish offers an impressive infrastructure. With their over 40,000 individual IP exit addresses, you will probably never get the same one twice. 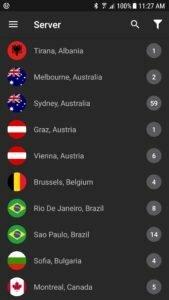 They offer over 1000 server locations to connect to over 60 countries. 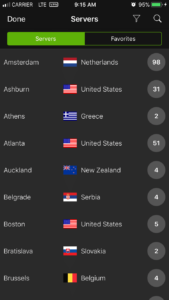 In large countries, there’s no shortage of servers to connect to so they have an excellent capacity, which leads to great speed. These locations cover North America and Europe very well, but Africa and Asia are only sparsely covered. Very few VPNs cover these continents very evenly, but this might be an issue if you are going to travel there regularly. 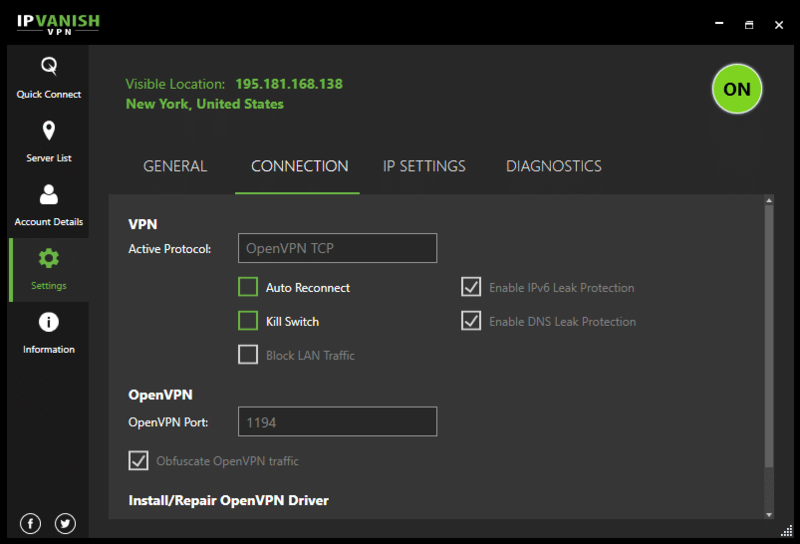 IPVanish has an average cost for a high-quality VPN. Their month to month cost is $10, which can be a bit less than other competitors for pay as you go; if you are considering only buying a single month for a trip to another country, they are one of the cheapest. If you subscribe for a year the monthly cost is $6.49, which is merely average though. They accept credit card and PayPal for payment; there is no option for bitcoin or other esoteric forms of payment if maximum privacy is your goal. For your money, IPVanish offers some of the best service limits. Unlimited bandwidth and reconnections are included with the service. They also allow for ten simultaneous connections; this is the most for VPN services. Access clients are available for all the usual operating systems, Windows, macOS, iOS, and Android. They even have clients for more esoteric devices, such as Ubuntu Linux, Chromebooks, Windows Phone, and whole house routers. 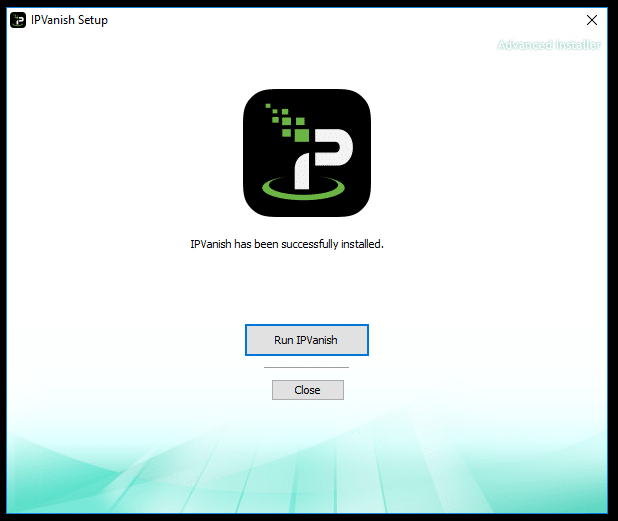 IPVanish recently started offering a new SOCKS5 proxy server. 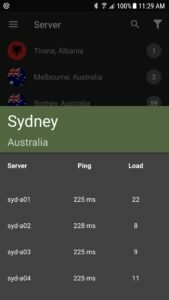 Using this proxy gives you the privacy of routing your traffic through their servers, without the performance loss inherent with a normal VPN connection. They also expressly disallow use of the service for illegal activity and for accessing infringing copyrighted, protected content. Given that legal requirement, their website states that they do not block access to any sites or P2P. 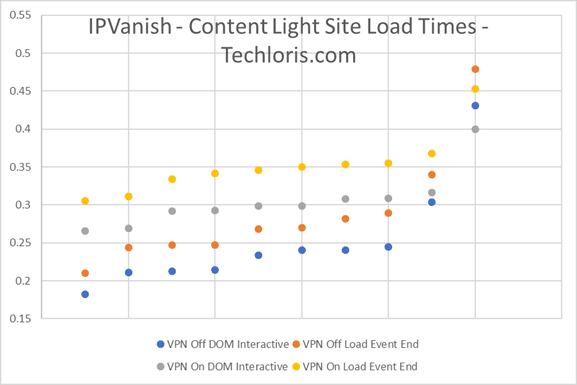 Using any VPN service will come with a performance impact. We evaluate both automated synthetic tests and subjective experience when evaluating a VPN service. All tests are performed using a dedicated wired internet connection. IPVanish’s claims of being fast are true. In our synthetic download tests using both fast.com and speedtest.net, we saw no issues. We ran each test 5 times both connected and disconnected from the VPN. The VPN introduces about a 20% hit to the maximum bandwidth; this is normal for all VPN connections. 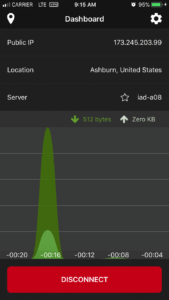 The results did not show any variance over time; this indicates that they are not throttling traffic nor are their servers overloaded with connections. 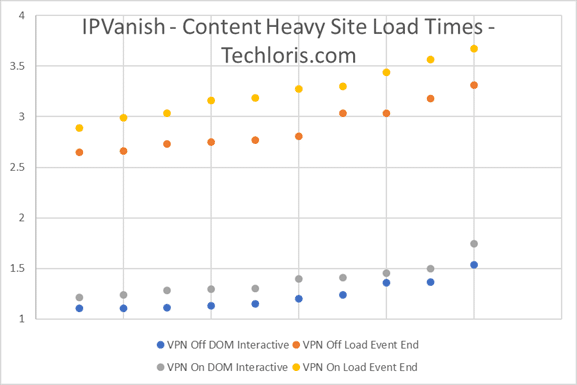 Page load times were not adversely affected by the VPN. We use a tool to automatically time accessing different websites multiple times without local browser cache. This is tested on simple pages and pages with many scripts and lots of content. Using IPVanish only added approximately 500 milliseconds to most page loads. This was consistent for simple pages and complex ones. This delay is just from the added round trip time inherent to using a VPN, and that it was consistent regardless of page type gives us confidence in their service reliability. 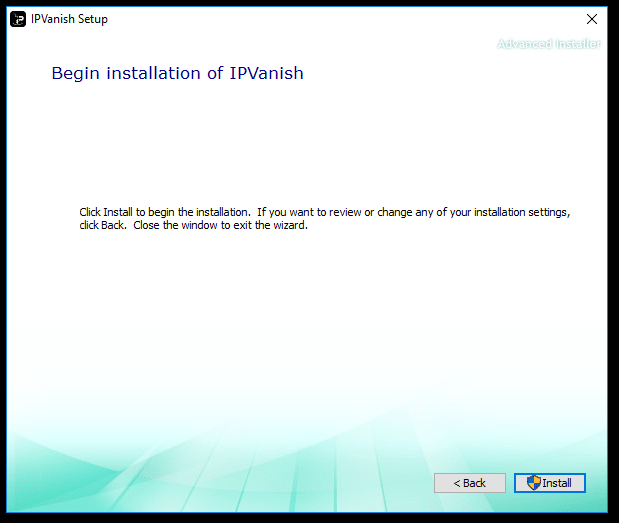 In general day to day use, we didn’t notice any issues while using IPVanish. Web pages were responsive, and downloads were consistent. Any delay introduced by the VPN was not enough to be noticeable. In most instances, download speed was affected more by the providing web server than by IPVanish. In our video streaming tests, we try accessing different video services for availability and smoothness of playback. Youtube video streamed fine at 1080p resolution without stuttering or buffering. IPVanish’s website mentions several video services that work (https://www.ipvanish.com/services/), but Netflix and BBC iPlayer are conspicuously absent. When we tried streaming Netflix connected to IPVanish, we were able to watch videos while connected to some servers, but not while connected to others. For instance, connecting through Boston, Netflix wouldn’t allow streaming, but while connected to New York they allowed it. Netflix is notorious for blocking streaming over VPN connections, so this is about average. Connecting to servers in the UK located in different cities, BBC iPlayer did not load with a VPN access warning. 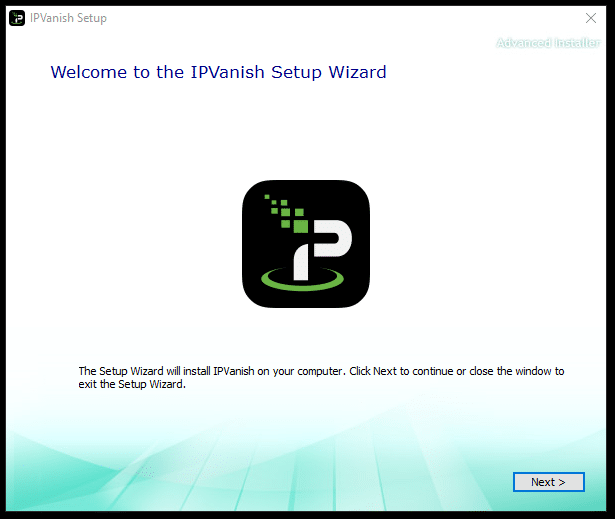 We found the IPVanish desktop client to be simple and easy to use. The large green On/Off button at the top of each screen makes it clear if you are connected or not. 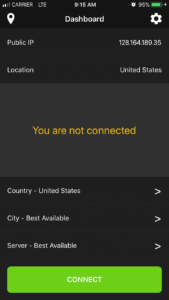 The Quick Connect screen makes it convenient to connect to the closest servers. The bandwidth graphs are a nice touch showing how much traffic is flowing through the VPN. 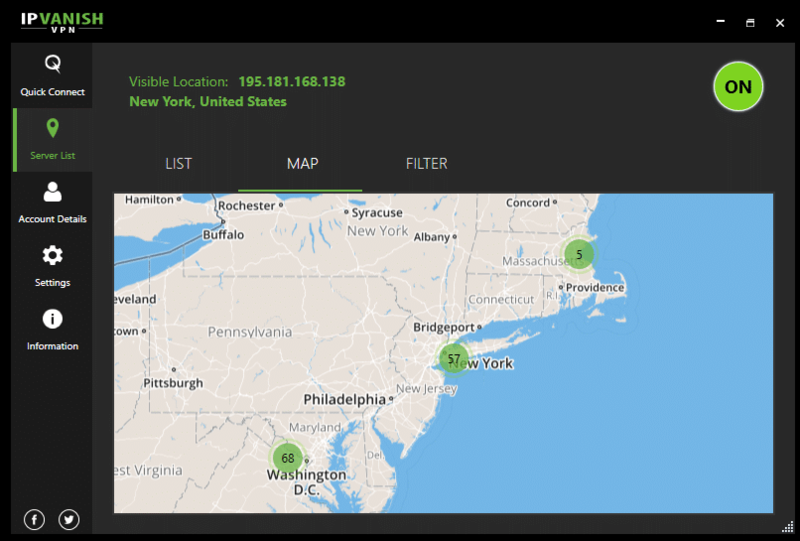 The full-featured Server List can allow you more fine-grained control; it will even provide the ping time and current server load at each location, which is a nice touch. The map view allows you to see the servers grouped geographically, but it doesn’t show all the servers when zoomed out, limiting its usefulness. The Settings page gives access to useful features. You can change the connection protocol instead of being forced to use only one type; this is great if you are at a location that may be blocking one type of traffic or if vulnerabilities are found in a specific protocol. The diagnostics screen shows you the log files collected by the program. I did notice my computers MAC address was contained in some of the diagnostic logs, so, if you are privacy-focused, you should review the logs if asked to provide them. Installing and running the Windows client was straight forward. Installation required administrative access to the computer. It’s also worth noting that we were required to scroll through the ToS before accepting them during installation. 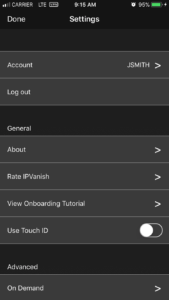 The IPVanish Mobile Clients for iOS and Android are available on the respective app stores. Setup was as simple as installing from the store and entering our login credentials. They provided the same usage graphs as the desktop clients and the ability to select your server. They use the built-in VPN services offered by the OS which give you a nice notification in your top bar when you are connected. 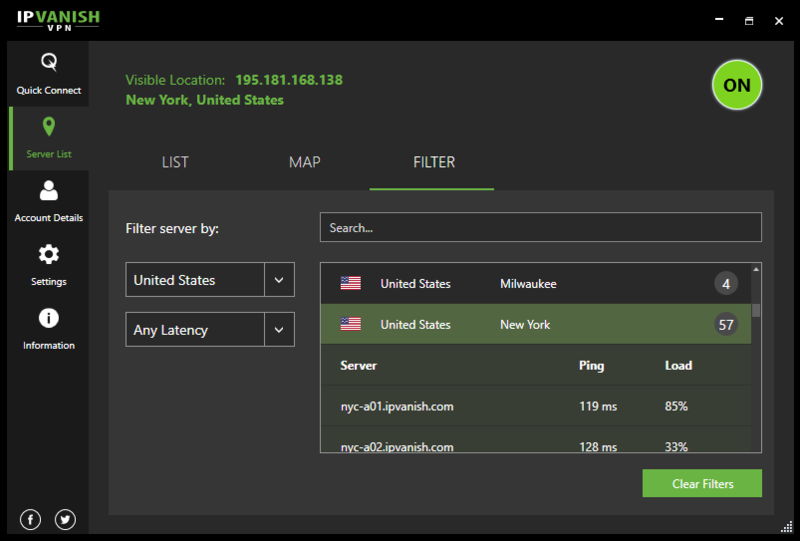 IPVanish offers excellent connection security. The desktop client offers multiple VPN protocols you can select from including Open-VPN and L2TP; these use industry standard 256-bit encryption. We found all the protocols well supported. The settings are configured out of the box for most home users, but if you are privacy-focused or will be traveling there are advanced features available such as a built-in kill switch and blocking LAN traffic. The client also offers built-in IPv6 and DNS leak protection. Using Wireshark, we performed some packet captures of the connection and some traffic on both the Open-VPN TCP and IKEv2 protocol. All internet traffic was encrypted and anonymous. The open-VPN protocol did contain the URL ipvanish.com in plain text during the handshake procedure, but this is a limitation of the TLS encryption. It’s again worth stating that local LAN traffic was allowed by default. 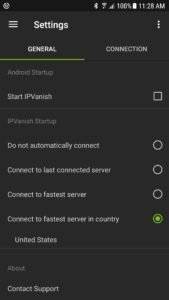 IPVanish is a fair option to consider for a professional looking for a VPN. They offer a good number of speedy servers at a reasonable price, and their connection to a larger internet services provider offers them the legitimacy that can be lacking from smaller providers. More privacy concerned customers may want to stay away though, not accepting Bitcoin payments and having offices in the USA may be off-putting to them. They offer all the standard features and clients that you may need. 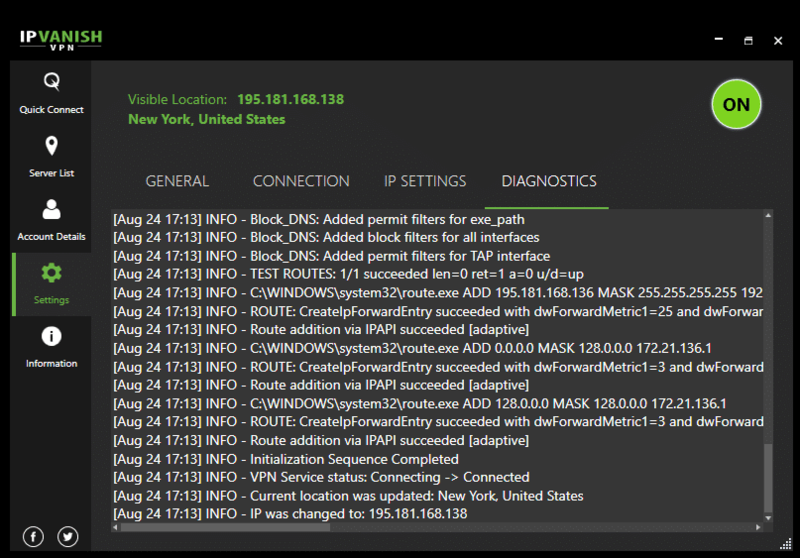 IPVanish also includes options for advanced users, such as a SOCKS5 proxy and whole house router support. But the lack of support for some streaming sites and no built-in add blocking might take it out of consideration for some. 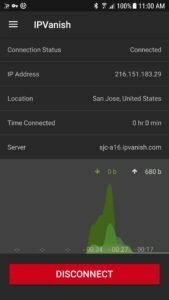 IPVanish set out to be the world’s best VPN, but did they succeed? That depends. Their excellent connection clients and strong network puts them as a genuinely top-tier VPN provider, but a few glaring omissions hold them back from earning a recommendation for everyone.